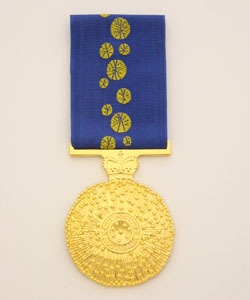 The Order of Australia was instituted with both a General Division and a Military Division. The two divisions are distinguished by a different ribbon. All classes of the order (Companion, Officer, Member and Medal of the Order) are available in both divisions. The eligibility criteria for the equivalent classes in the two divisions require similar levels of achievement, but those for the Military Division are designed to reflect military service. An individual may hold awards in both divisions and is entitled to wear the insignia of both. Appointment in the General DIvision take precedence over the equivalent appointment in the Military Division. The insignia of the order is a single flower head of mimosa, in the form of a convex disc. This provides the basic design for the insignia of all grades and the medal of the order, including lapel pins. There is no distinction between the insignia of the General or Military Diviosions. The ribbon is a royal blue with a central band of scattered gold mimosa. The ribbon of the Military Division is of the same design but edged with gold bands 1.5 mm wide. The ribbon colours reflect the national colours of Australia at the time the order was established. post-nominal letters ‘AC’, ‘AO’, ‘AM’ and ‘OAM’ according to the level awarded.